What Motivates the Left, Disdain for the Rich or a Desire to Help the Poor? I’m happy to discuss theory when debating economic policy, but I mostly focus on real-world evidence. 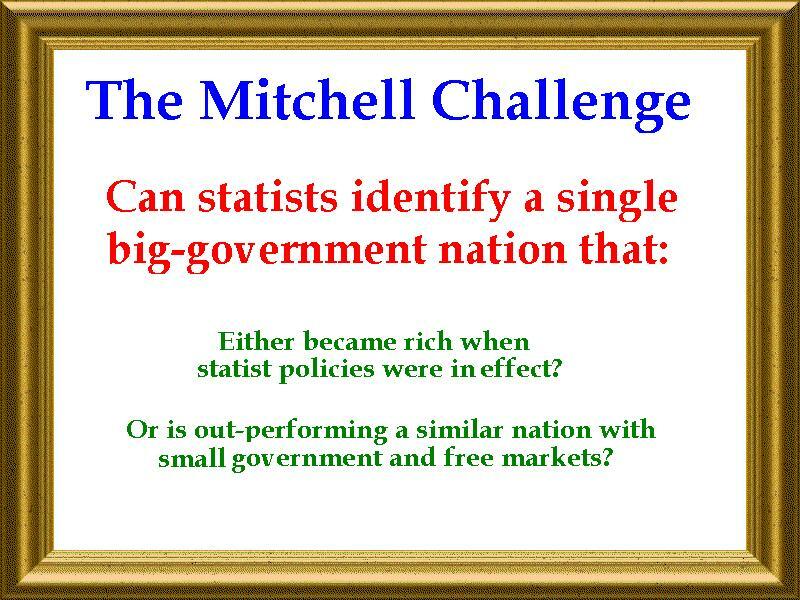 That’s because my friends on the left always have a hard time answering my two-question challenge, which simply asks them to name one success story for big government. They usually point to Sweden and Denmark, but get discouraged when I point out that those nations became rich when government was relatively small. And I’m embarrassed to admit that some of my fellow economists once thought that communist nations grew faster than capitalist nations. But let’s not digress. I raise this topic because there are many critics of capitalism who admit that free markets generate more wealth, but they assert that society would be better off if incomes were lower so long as rich people suffered more than poor people. This strikes me as morally poisonous. But it also gives me an opportunity to cite a new study from the International Monetary Fund that allows us to further analyze this issue. The IMF report starts by noting that globalization (free trade, liberalization, etc) has been good for global prosperity. Over the course of the last decades the world economy has witnessed rapid integration. Most countries have opened up their economies and experienced an unprecedented rise in the flow of goods and capital across borders. This phenomenon – now widely known as economic globalization – was coincident with rising living standards in a large number of countries. Many developing countries have experienced episodes of strong economic growth and substantial poverty reduction as they integrated their economies with the rest of the world. Sounds like good news, right? It is good news, but those who fixate on inequality are worried. …while globalization might on average be good for growth, more might not always be better for all. 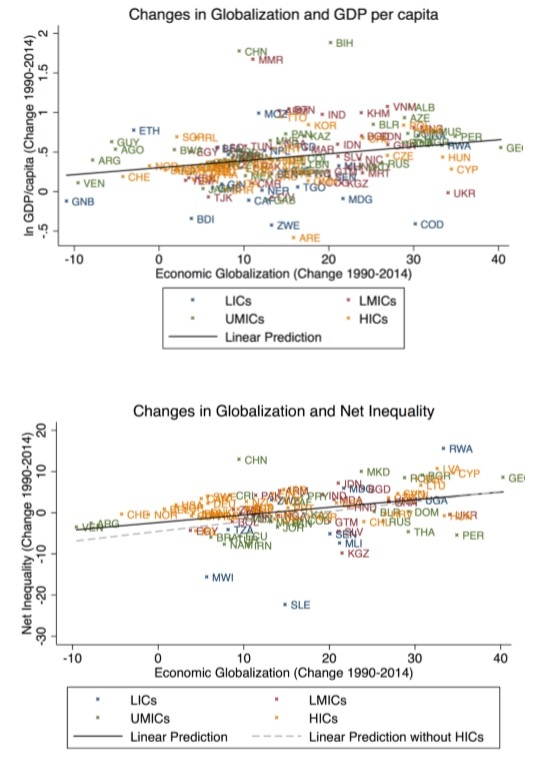 …When we shift the analysis to how income gains from globalization are distributed within countries, we also find globalization to have different effects on different incomes…gains are, however, distributed unequally both across and within countries. …Within countries, income inequality increases as a consequence of globalization. The income gains resulting from globalization tend to go primarily to the top of the national income distributions. In other words, rich people are getting richer at a faster pace. This phenomenon is captured in these two charts, which show that globalization is associated with more growth and more inequality. But what’s important is that poor people also are getting richer. In the subsample of developing countries where the gains from globalization are generally larger, however, they also reach the bottom of the income distribution and reduce poverty. … We find…some evidence of a poverty reducing effect of globalization in developing countries. Consider, for example, the remarkable data I shared about China. Income inequality increased at the same time that poverty dramatically declined. And those results seem to hold for the rest of the world, especially in developing nations. 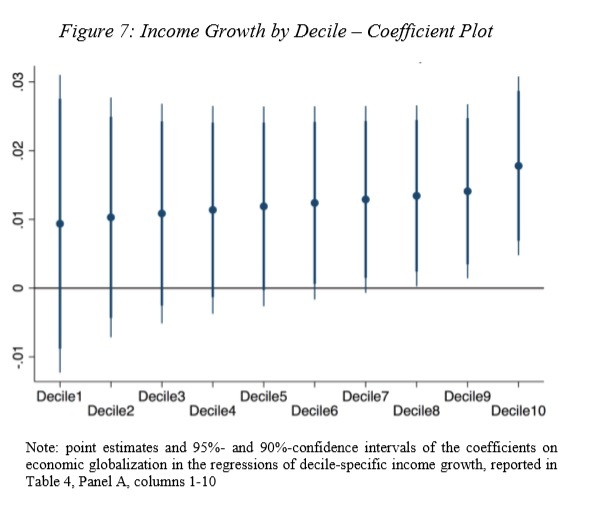 So now let’s look at the most important chart from the IMF study, which shows that all income groups enjoy more prosperity with globalization. Yes, rich people benefit the most, so official inequality numbers will increase. But put yourself in the shoes of a poor person. Would you be willing to forego your additional income in order to deny additional income for a rich person? I suspect the vast majority of poor people would think that’s a crazy question. But, as Margaret Thatcher pointed out, there are plenty of folks on the left who think that’s a perfectly reasonable position. Including, incidentally, some of the people at the IMF. People on the political left have different priorities and values then others. They think capitalism, freedom, liberty, individualism, choice are morally wrong. They agree with Marx that capitalism is evil. They’d rather the masses be miserable and the masses that vote for them agree. Its okay for their elites to get rich because they are making the right choices for the masses. Freedom-loving people need to make the case for capitalism and freedom, and not simply be against socialism. Say yes to capitalism, not only for the prosperity but also because it lets people be themselves. I know I know… “break out a straight jacket and an aluminum foil hat… this one belongs in the gulag”………………….. Envy is a powerful feeling, and that is the fundamental reason why we judge things on a relative basis. Otherwise we’d all be ecstatic that our current standard of living is far superior to 99% of humans who lived on this planet in any other previous era/century. However, what those who put too much weight on the limbic envy side of their brain fail to comprehend is how powerful and all dominating the compounding of growth rates becomes even in a rather short period of time. Hence redistribution becomes the fundamental elixir of big government and decline. As I said a few times the voter-lemming electorate has two choices: either accept the sight of the mansion at the end of the cul-de-sac, or see his country’s world prosperity rankings decline quite fast. While individual countries follow a serendipitous growth trajectory, the world average remains at four percent growth rate, with irreversible accelerating tendencies that boot. Therefore, countries that cannot match the four percent growth rate will see their world prosperity rankings erode quite fast. Gone are the days when these processes took centuries. At a four percent overall world growth rate growth disparities are so large that country prosperity ranking reshufflings will conclude within a few short decades. Hence, stay mobile. Especially if you start seeing Bernie Sanders and Elizabeth Warren twitter messages in your neighbors’ smartphones. This scenario of decline has played way too many times the world over to simply ignore. The world is now turning and reshuffling at breakneck speed irreversiblybaccelerating into the future. By virtue of the law of probabilities America’s turn will come sooner or later.